Today we had a major breakthrough – we received the shipping containers full of concrete molds for the concrete bricks that form our Fuller Center homes. That might not sound like much, but considering these containers have been sitting in port for the past eight months due to hostilities after the 2010 earthquake – it is. So, we spent a majority of our morning hauling these molds into a warehouse outside of Grace International. It was a little monotonous but necessary, and it’s a good reminder that with this type of work, flexibility is as essential a tool as a pair of pliers on the worksite. From late morning into early afternoon, we helped the women in the outdoor kitchen cook again. We spent about an hour doing this until lunch, which consisted of peanut butter and jelly, hamburgers, salad, spicy coleslaw, papaya and fried plantains. After lunch, we went to the worksite for the remainder of the day. We began laying the concrete bricks with mortar, which is an exciting next step because it means we’ve finished the foundation and are on to actually building. Aside from these activities, what stuck in my mind the most were the conversations that threaded their way through the day. One particularly interesting exchange centered around a major issue in Haiti – the destruction of the environment. In less than 20 years, 50 percent of the trees have been cut down for firewood and charcoal production. This creates an inefficient cycle that ultimately creates destruction on a long-term scale – deforestation causes erosion of the topsoil, which ruins healthy, sustainable agriculture for farmers and makes the country even more dependent on exports from other countries. “We need to provide solutions and alternatives. You can’t just tell a poor man not to get coal; you have to provide alternatives to coal,” said Jonny Jeune, director of The Fuller Center’s Covenant Partner organization in Haiti called Grace Fuller Center (whose name is derived from one of our primary partners in Haiti, Grace International). In partnership with Project Gaia, another non-profit, Grace International is working to provide such an alternative by exploring installation of an ethanol distillery and cook stoves for the families in the homes that the Fuller Center will build. Obviously, this problem with deforestation is just one of many – but it’s a reminder to keep a broader, holistic perspective in mind – we’re building homes for people who have multifaceted needs. We’ve been working toward this vision little by little all week, and our last day in Haiti was no exception. We spent the duration of the day on the construction site, working to lay more bricks on the home. We won’t finish the home this time, but we did our part, which the Haitian labor force and future teams can build upon. As I walked around the site’s premises one last time, I saw and heard everything that became familiar to me in the span of just a few days – women carrying buckets and baskets on their heads, rhythmic music pouring from the street beyond, an array of farm animals wandering by, people chattering to each other in Creole. I’ve realized that in one week, I cannot possibly even come close to telling Haiti’s story. All I could do while I was here was to open my eyes, mind and heart and give my perceptions. Something I’ve also come to know is that each of the women I’m here with has all seen her share of hardship. Some have born witness to struggle in their travels around the world; some have lost husbands and buried children. They all have countless stories and tender spirits that are simultaneously stronger than steel. A lifetime’s worth of stories is behind their eyes. I can’t tell all of these in a week, either, but I know that they’re there. I can only be a conduit for what the stories have created. This week I’ve also reinforced my conviction that beauty and goodness always have a way of prevailing. It’s in the flowers that curl around barbed wire fences, in the gaze of both volunteers’ and homeowners’ faces and the light that emanates from their spirits, and in colorful signs that decorate the sides of houses, cars, and buses here. The black and white desperation engendered from the headlines in the news on Haiti has not been replaced but has been matched by a first-hand perspective; this is the pulsating hope that always, always takes its place right beside hardship. Our Fuller Center houses and most of all, the people who live in them, will stand as testament to that. 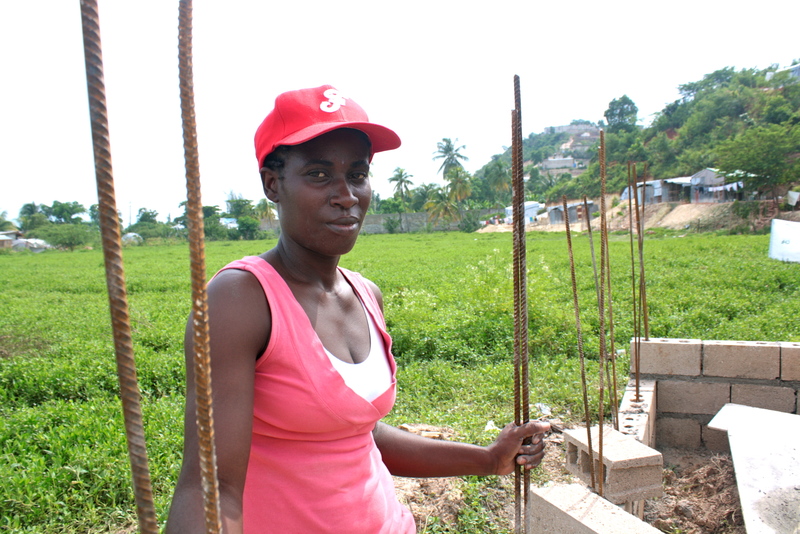 Check out more photos of the all-women build in Haiti. Read biographies on Fuller Center homeowners in Haiti.